Oh, what a difference some character history makes. “Requiem For A Dream” takes place largely inside a pseudo-dream world, which can often result in a narrative that feels wasted or not connected to the show’s actual reality. Instead, the episode uses these dreams to connect deeply to the core characters on the show and their history with each other, making the dream world more vital that much of the show’s actual reality has been recently. It’s one of the best episodes of the back half of season seven, and sends The Vampire Diaries into its season finale on a positive note. The core concept of the story is that in order to live Bonnie has to inherit Rayna’s powers, and she is trying her hardest to do anything she can to not let this happen. The easiest way Bonnie sees to do this is to never actually wake up, figuring that allowing herself to slip away and die would be better than a life where she’s cursed to chase and kill everyone in her life that she’s ever loved. It’s the first signpost that this is going to be an episode rooted firmly in character history, as Bonnie sacrificing herself to save her friends is the most consistent thing about her character. What follows is a series of dream encounters where the curse is slowly re-stitching the fabric of Bonnie’s character, forcing her to perceive all vampires as evil, while her friends try any way they can to reverse the damage. 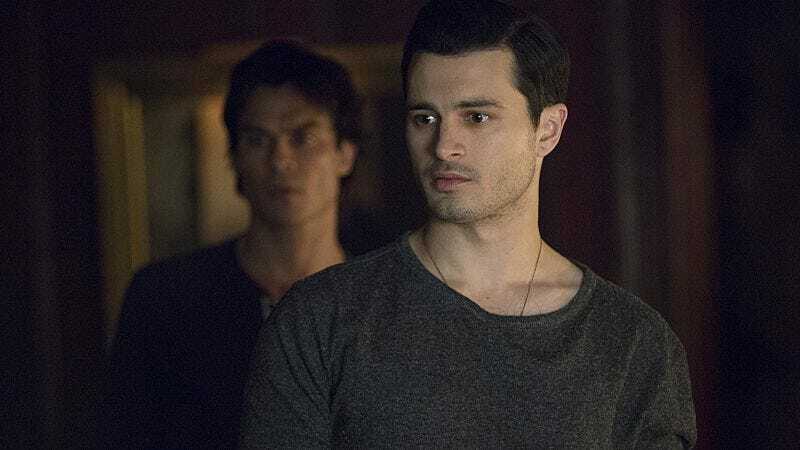 The result is a step back into the character dynamics that are the foundation of the show, as first Caroline, then Enzo, and then Damon reach out to Bonnie in her dreams in an attempt to help her fight the curse in any way they can. Every single encounter is steeped in the history between those two characters, and it creates scenes as strong as any in the entire season. In Caroline’s scene, it’s a reminder of the time when Bonnie and Caroline felt like actual friends rather than characters who never interact anymore. Enzo’s scene is even better, a lovely look at what is developing to be an honest-to-goodness, successfully executed love story between Enzo and Bonnie. When Bonnie tells Enzo she’d rather die and have their happy memories together rather than tainting them by living in a world where the curse forces her to hate him, it feels more real than anything that’s come before it in the relationship, in a believable way. The biggest of these scenes is the Damon scene, which is appropriate given their relationship is the one most developed. Damon takes a very Damon approach to helping Bonnie, deciding to anger her into waking up and then appealing to her once she’s actually awake. 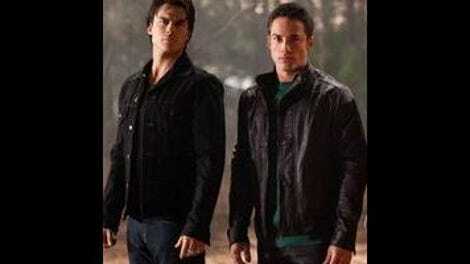 The anger is wrapped up in both of their connections to Elena, which is the thing that ties them together at the very core. What the scene recognizes, though, is how their friendship transcended this bond a long time ago and now exists as its own precious thing, a thing Damon tries to use to anchor Bonnie and release her from the curse. It also gives Damon the chance to truly apologize, and his declaration of “I admire you. I believe in you. And I love you the same way Elena loved you. If you kill me right now, it’s not your fault. I did this to us. But please. Forgive me before you do what you have to do.” is perfect. When the writers mine these relationships and bring out the depths available in seven seasons of backstory, they can still make magic. There are still things about the episode that don’t work, and it’s the same things that already haven’t really been working at all. Matt still feels weirdly integrated into this season, even if now he has more of a purpose dealing with helping Bonnie than he had before. The biggest problem, though, remains the Caroline story, as she tries to manage dealing with her feelings for Stefan and how that can possibly integrate with her life with Ric and the kids. The story basically takes Caroline’s decision out of her hands, as she gets marked with Bonnie’s stake and now has to run indefinitely in order to keep the kids safe from Bonnie. There are moments where Caroline seems like she gets her own choices again, like when she actually gets to tell Stefan just how much he hurt her by leaving, but her running away with Stefan (instead of returning home to Ric) is fully motivated by plot, once again appearing to take away her choice. From conception to execution, this entire story has been one ill-conceived choice after another, and this doesn’t help matters. Despite the issues with Caroline’s story this episode does feel like it gives some good momentum going into the season finale, even if that momentum is a bit tacked on to the end of the episode in somewhat of a jarring stylistic departure from what came before it. In order to save Bonnie, they need to get into the Armory (remember them?). To get into the Armory, they need to undo Bonnie’s spell and potentially unleash the evil vault monster (remember that?). Season seven might be a scattered mess of story remnants, but even if the build-up is less than satisfying at least those remnants appear to all be coming together in the end. The phone call between Damon and Stefan was the best Salvatore brother scene in ages. Them arguing about the different ways they creepily goad the ones they love into staying safe is basically the foundation of their relationship, and I’m happy to see them get back to that after the whole “Damon is the devil” interlude. Caroline doesn’t know if she loves Ric. Caroline. We’ve seen your body language around him. You don’t love him, girl. Three years in the future Klaus is nowhere to be found. Did we know this and I’m forgetting? Bonnie’s call to Caroline where she talks about seeing her in her mind was extremely creepy. Kat Graham sells that menace so well.